Vampires. We all know what they are and they come in different forms such as cereal mascots, sparkling men *ahem* and Muppets. Many animals are also known as vampires due to the fact that they drink blood for sustenance. However, the animal whose Latin name literally translates to “Vampire squid from hell” surprisingly feeds on plankton. Vampire squids live in tropical deep-water zones worldwide at depths of 600 to 1200 meters. They have eight arms, blue blood, large eyes and a beak at the centre of the their arms. When threatened the vampire squid pulls its arms and webbing backwards over its body to form a protective ball around itself. Since their mantle is dark, this position called the “pineapple posture” allows them to become nearly invisible in the dark depths of the ocean. Additionally the tips of their tentacles release bioluminescent mucus that can glow for ten minutes which helps them to distract predators with a pretty light show while they make their quick escape. In order to survive on the very little plankton they feed on as well as to survive in oxygen-starved waters, vampire squids have very low metabolism. They are naturally buoyant and more or less drift around rather than swim, but if required they can swim fast using jet propulsion and also by flapping the ear like fins located at the top of its body. Females lay fertilized eggs directly into the water and the transparent hatchlings lack the webbings that the adults have and they also have small eyes. They feed on their yolk sacs until they are able to fend for themselves and once they mature they can grow up to a foot long. 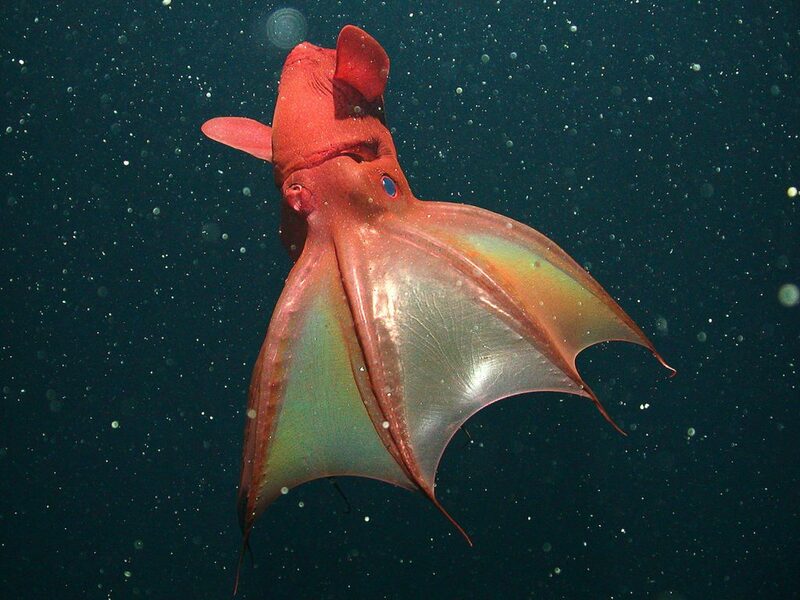 Despite the scary name vampire squids are actually quite peaceful animals that neither drink blood nor burn in the sun, although I have my doubts now considering how that might explain why they float around at the bottom of the deep dark ocean. Previous post So which invertebrate has the largest brain? Next post Diving myths: Is it really as dangerous as people make it out to be?